I've reviewed the iFootage Shark Slider combined with the S1A1 Motion Control in the past (video review seen here). This time we're adding on the X2 Head that allows for Pan and Tilt of the camera. 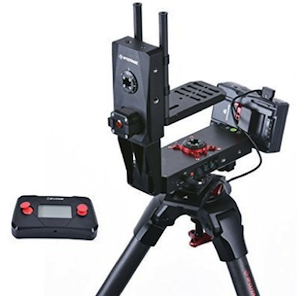 With this, you have a fully motorized advanced 3-Axis Motion Control System that allows for accurate movements and positioning for Time Lapse and also incredibly silent for real time video use. Here's a quick video on how to use this system for that popular Parallax Tracking effect often used on B-cam setups during interviews. The X2 Motion Pan/Tilt Head can also be used without the Shark Slider. So if you want a simple 2-Axis Motion Control Timelapse system, just throw it directly onto a tripod. Or use it at the end of a jib as a wireless motorized PT Head. I personally have only dabbled in some of what this entire system offers, and it is capable of far more advanced functions that what I have shown. It's not the cheapest motion control system avialable, but it's incredibly accurate if you need to repeat shots, highly programmable, and best of all incredibly silent (important for those interviews). 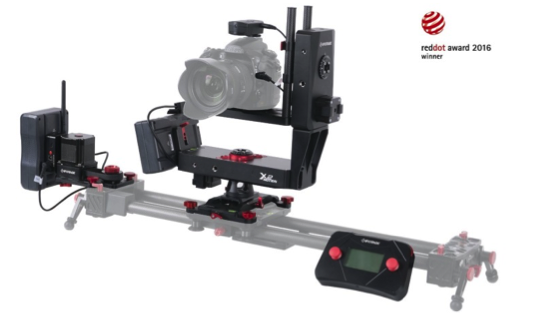 You can find more information about iFootage Motion Control Equipment over at CamotionLLC.com (found here). Posted in dslr video. Tags: Carbon Fiber Slider, ifootage motion control, ifootage shark slider, moco, motorized slider, s1a1 motor, time lapse slider, Timelapse, x2 pan tilt head on October 14, 2016 by Cheesycam. Hey there - you seems to have a lot of knowledge about motion controlled sliders. I have watch a lot of your videos, so I was hoping you could make a recommendation. I want to do video clips of products with a macro lense, where the camera "wraps" around the product. Essentially the same concept as using the motorized slider for motion on an interview, but here the subject is much smaller. About the size of pen top or pencil eraser. In your opinion, does this system have enough precision to make that happen. I realize that the movement would be something closer to inches than feet, but just trying to see if the slider can move precise enough for smooth video motion in all axis. Thank you for any insight you can provide. @marco - The motorized Slider can handle the UrsaMini or FS7 if you use a normal fluid head on the slider. But the 2 Axis head for tilting and panning max weight is rated at 9lbs (balanced). You'll have to weigh your setup to make sure you aren't exceeding that. Do u think it can handle your ursa mini (or mine fs7)? Looks like a great system! I imagine it does ramping in all axis?